What do dogs and rock ‘n’ roll have in common? Well, normally not a lot…but in this case they’re a winning combo. A fun and entertaining online slot from Cozy Games. Dog N Roll cleverly mixes the diva filled world of rock and roll with some cute and characterful canines. Fancy giving it a go? Here’s the lowdown on what’s on offer. Welcome to the world of Dog N Roll. Where you’ll get to see dogs taking up a rather different role to usual. No more being walked on leads – these canines are living it large on stage. Set on the centre stage of a stadium (nothing less for these dog stars) you’ll get to meet five furry canine friends who are totally rocking the rock star and living the musical dream! Perfect for both dog lovers and fans of good old rock ‘n’ roll, this lively slot has the potential for you to win up to £1000. 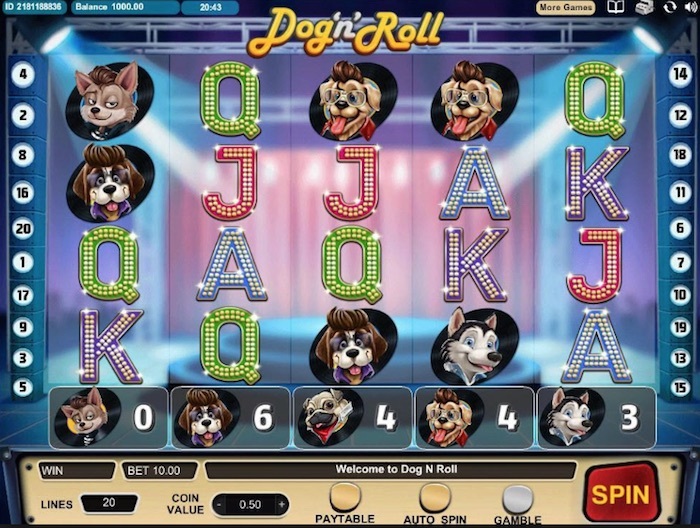 Dog N Roll is one of the slots by Cozy Games and is produced to a good standard, with eye-catching graphics and doggie characters that are oozing with canine charm. The slot offers 20 paylines across five reels and includes wild symbols and scatter symbols that help liven up the play. There’s a great bonus round too, where you can win up to 50 times your bet. With a coin value ranging from just 1p up to 5p, the Dog N Roll slot offers a good range of options for the lower level of betting. The Dog N Roll slot has been expertly designed by a reputable company. It boasts great graphics and good playability, both on mobiles and desktop PCs. Each of the five canine stars has been designed so their own individual personalities shine – they’ve got the hairstyles, glitz and glamour that you’d typically associate with human rock n roll stars. Each time you hit a win, the spotlight shines down like a beam of light to let you know, which is a nice touch to the graphics and helps add to the overall theme of the game. Unlike some games when the key details can be hard to find, when you play Dog ‘n’ Roll, there’s a button at the bottom of the screen to click on to view the paytable. The table clearly sets out what each of the key symbols is and what they’re worth, whether you get them appearing three, four or five times. There’s the good old A, K, Q and J symbols, the five canine stars, plus a paw print scatter symbol and a special dog that serves as the wild symbol. Plus, there’s also special bonus symbol, of a record player. The wild symbol substitutes for all the main symbols, except the scatter and bonus. If you get three paw print scatter symbols appearing, then you’ll win five free spins. The scatter symbols and wilds help liven up play, but there’s also an excellent bonus round to get your teeth into. Underneath the main reels, you’ll see a row of dog symbols. These aren’t just there for decoration – they serve a nifty bonus purpose. Every time you win a line involving a dog symbol, you gain a scratch card. Each of these scratch card wins is saved. Your collection is highlighted by a number appearing next to the relevant dog symbol at the bottom. By playing more spins on this mobile casino slot, you’ll gradually collect more scratch card wins. The bonus comes into play when you get three bonus symbols – a record player – anywhere on screen. You’ll be awarded the highest number of scratch cards available in your bottom bar. Then all you have to do is match three or more of the same symbol on the scratchcard to win the corresponding payout. The payouts are 5x, 10x, 15x, 25x and 50x your original bet. The more cards you’ve gained, the more chances you have to win. The betting levels on the Dog N Roll Slot suit low-level players and the majority of the £1 per play slots market. Starting from as little as 1p a bet per coin, that’s 20p a spin, you can play for real money up to £1 per play on a game with high economic spin value. Betting range 20p to £1.00 per spin. There’s no progressive jackpot on this slot, but there is a rather tasty maximum win of £1000 on offer. And when you trigger a bonus round, you could win up to 50 times your bet. Not something to be sniffed at. Finally if you love a spot of canine capers, and are looking for a game where you can play at a low or high spin rate, then the Dog ‘n’ Roll slot could be the perfect choice for you. It’s nicely produced by Cozy Games Slots, with top notch graphics and sound, and each of the doggy rock stars is oozing with personality. What’s not to love about a dancing diva dog? !